Meaghan Mountford’s Sugarlicious is a whimsical book of crafty sweets, one that is bursting with ideas guaranteed to impress the lucky recipients of these goodies. Her book combines the traditional elements of a baking cookbook and the quirky ingenuity of a craft handbook—meaning that anything you create from her pages will be a total crowd pleaser! On the very first page of the Preface, Mountford lays out the “measuring cup” system she uses to rate each project’s difficulty. Novice readers will be happy to find many one- and two-cup recipes, but even three-cup recipes will be doable with a bit of time and patience (and perhaps practice). She even identifies store-bought substitutions for those of us who aren’t in the habit of making our own fondant (I’m sure I’m not alone there!). The next chapter provides all of the recipes you’ll need to put together the adorable themed treats in the following pages—everything from Royal Icing to Marshmallow Fondant to Candy Clay. And the crafts, oh, the crafts! Whimsical hand-drawn illustrations take us step by step through the creation of Farm Animal Snack Cakes, Solar System Cookie Pops, and even Sparkly Stained Glass Ornament Cookies. Mountford’s final chapters explain in detail the techniques used in assembling these gorgeous crafts, skills like flooding with royal icing and tinting coconut. She even goes the extra mile, listing all of the stores and websites she uses to buy all of her craft and baking supplies. Brightly colored fonts are splashed all over each page, and the photos in Sugarlicious make you feel like you could jump into the book and gobble up every last sprinkle, marshmallow, and frosting swirl. 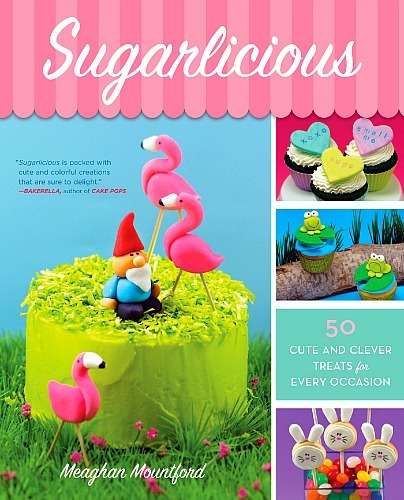 This book will definitely appeal to ambitious, crafty bakers—but you don’t have to be a part-time cake artist to enjoy Sugarlicious! The easy-to-follow recipes and techniques are sure to build any baker’s confidence and abilities…just in time for you to show up at your next study group with a batch of Milk Shake Cake Pops. Leave a comment below and tell us about your favorite cake/frosting combo. Classic vanilla/chocolate? Red velvet/cream cheese? Spill. Be a subscriber to the SKC newsletter (we’ll check!!). Tara Powers is a graduate of Villanova University, publisher by day, and baked good taste tester by night. She owns more cookbooks than is entirely normal and blogs about her kitchen hits and misses over on Chip Chip Hooray. Serves as many lollipops as you can make! Line a baking tray (or trays for many lollipops) with wax or parchment paper and set aside. Melt chocolate according to the recipe directions. [Either melt chocolate chips on the stove using a double boiler, or use the microwave.] 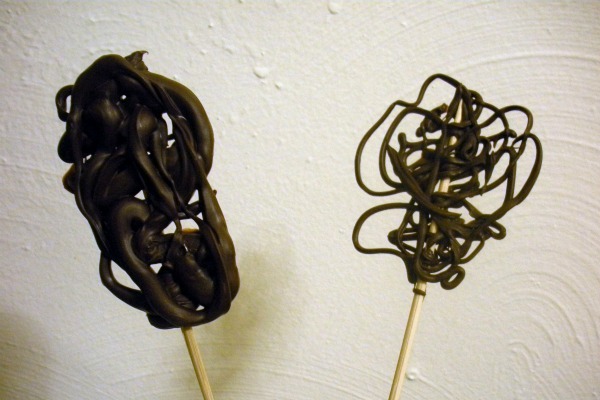 If you melt on the stove top, transfer the melted chocolate to a disposable decorating bag. The easiest method is to melt the chocolate chips right in the disposable decorating bag in the microwave. Twist the decorating bag at the top of the melted chocolate and hold the bag at the twisted part. Snip the corner of the bag 1/4 inch. Start piping a chocolate design on the wax paper, pause, lay your lollipop stick on the design, and continue to pipe the design with chocolate, covering the lollipop stick. Pipe as controlled or crazy a pattern as you like. Refrigerate the lollipops until set, several hours. If you are using candy melts, let the lollipops set at room temperature. « prev | Giveaway: Batten Island Gourmet Sauce Winner! My favorite cake/frosting combo comes from a specific recipe. Hersey’s coco powder has a wonderful recipe but I add an extra ingredient to give it a kick. I add a small amount of coffee and it tastes so yummy! I learned this from my Dad. I have always been a chocolate cake, chocolate frosting type of girl. You can never get enough chocolate. I gotta go with chocolate cake with chocolate icing! Mmmmm! Usually I’m a chocolate kinda girl but when it comes to cake, I love me some carrot cake with cream cheese frosting! My go-to combo is vanilla with chocolate ganache. cheese cake with chocolate icing! I love peanut butter cake with choc. icing. New fan on your Facebook page! My favourite combo (I think.. but there are many runners up) is chocolate cake with white buttercream frosting. Simple and yummy. fav combo is carrot cake & cream cheese frosting. oh yeah, i follow on fb & email. We do believe each of the thoughts you’ve announced in your submit. They’re quite effective and definately will absolutely function. Even so, the particular threads are far too quick first of all. Could you please stretch these just a little out of following time period? Basically posting.